If you want to make it easy for your teams to work together using the latest productivity solutions with built-in security—while saving thousands of dollars in implementing the solution—you've picked the right book. Inside, you'll gain an understanding of Microsoft 365 Business, a complete integrated solution for business productivity and security powered by Office 365 and Windows 10. You’ll also learn how this cloud-based solution can help grow your business while protecting company data from potential threats using the same security management tools large enterprises use. 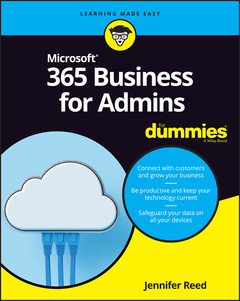 Microsoft 365 Business For Admins For Dummies provides business owners, IT teams, and even end users an understanding of the capabilities of Microsoft 365 Business: an integrated platform and security solution built with the latest features to enable today's modern workforce and empower businesses to achieve their goals. - Get the guidance you need to deploy Microsoft 365 Business and start driving productivity in your organization while taking advantage of the built-in security features in the solution to grow and protect your business today. Jennifer Reed is the co-author of Office 365 For Dummies and founder of Cloud611, an IT services company that helps SMBs take advantage of cloud technologies to drive business outcomes. As a solutions architect, Jenn has helped migrate thousands of users to Office 365. As a manager of a high-performing team of solutions architects, Jenn's focus is enabling IT departments to adapt to evolving technological innovations and adopt the best approach to digital transformation.